Daniel Aaron, the founding president of the Library of America and a defining figure in the field of American studies, died Saturday in Mount Auburn Hospital. The cause of death was complications of pneumonia, his daughter-in-law Anna Mundow said. A Cambridge resident, he was 103. Dr. Aaron, who was Victor S. Thomas professor of English and American literature emeritus at Harvard University, once described himself as “part historian, part literary critic, part political theorist, an irregular in the ranks of the ‘non-Communist Left.’ ” His best-known book, “Writers on the Left: Episodes in American Literary Communism” (1961), brought together all those elements. Trim and angular, Dr. Aaron resembled a professor out of central casting. He smoked a pipe, favored tweed jackets, and was unfailingly avuncular toward students. “He wore his eminence very lightly,” Walter Isaacson said in a telephone interview Monday. As an undergraduate, Isaacson, the president of the Aspen Institute and best-selling biographer of Steve Jobs, had Dr. Aaron as his senior thesis adviser. In other ways, Dr. Aaron differed greatly from the stereotype. 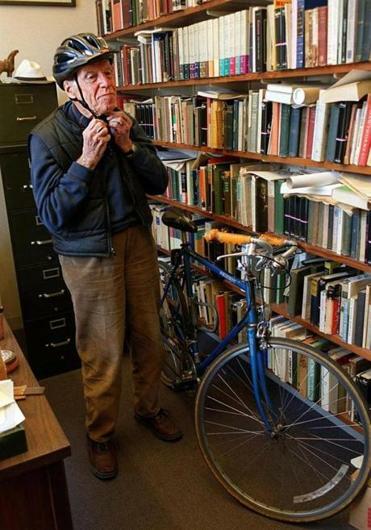 Well into his 90s, he cycled to his office, with a denim jacket thrown over his sport coat, and he never lost a Prohibition-era fondness for the occasional glass of Irish whiskey. An undergraduate named John F. Kennedy got a B from Dr. Aaron in Harvard’s introductory American literature course (“a rather respectable grade in those days,” Dr. Aaron recalled). Another undergraduate, Betty Friedan (“very formidable,” he called her), thought enough of his counsel during her days at Smith College to put him in the acknowledgments to “The Feminine Mystique.” Dr. Aaron taught at Smith from 1939-1971. Adlai Stevenson was among the political luminaries Dr. Aaron and his wife, the former Janet Summers, hosted at their Northampton home during his time at Smith. They were influential Democratic activists in Western Massachusetts during the 1950s and ’60s. Mrs. Aaron died in 2003. Authors Dr. Aaron knew included Sinclair Lewis, Ralph Ellison, Saul Bellow, Robert Frost, Lillian Hellman, Charles Olson, Truman Capote, V.S. Pritchett, Czeslaw Milosz, and Edmund Wilson. As an undergraduate, he sat next to the poet W.B. Yeats at an English department banquet. His friendship with Frost began one summer at the Bread Loaf writers’ conference, when they pitched for opposing squads on the baseball diamond. His friendship with Wilson led to Dr. Aaron’s becoming founding president of the Library of America, in 1979. The library was a long-cherished Wilson project. The famous man of letters wanted to see classic American writers made available to the public in accessible, authoritative texts. As a boy in Los Angeles, Dr. Aaron saw the cowboy star Tom Mix drive by in a Locomobile. The actor gave the child a wave. Two decades later, he saw Franklin D. Roosevelt’s touring car drive down Massachusetts Avenue, across from Harvard Yard. This time Dr. Aaron was the one waving. As a young man in Chicago, Dr. Aaron developed a lifelong love of jazz. During his graduate student days, he traveled to New York to see the legendary 1937 Orson Welles staging of “Julius Caesar,” as well as the storied Group Theatre productions of “Waiting for Lefty” and “Awake and Sing!” On later visits, he’d go drinking with the poet Delmore Schwartz at the Cedar Bar. Dr. Aaron was born in Chicago on Aug. 4, 1912, the son of Henry J. Aaron and the former Rose Weinstein. The family moved to Los Angeles when Dr. Aaron was 5 because of his parents’ ill health. Upon their death, seven years later, Dr. Aaron returned to Chicago to be raised by relatives. He graduated from the University of Michigan in 1933 with a degree in English. After two years in the graduate English program at Harvard, Dr. Aaron spent a year as an English instructor at Michigan. He returned to Harvard as one of the first two students admitted to the university’s American Civilization program (the other was Henry Nash Smith). Among his professors were F.O. Matthiessen, Perry Miller, and Howard Mumford Jones. He received a doctorate in 1943. Dr. Aaron served as president of the American Studies Association from 1971-73. Although he took emeritus status in 1983, there was little retiring about his retirement. Until recently, he would arrive at his Harvard office each morning and not leave until late in the afternoon. “I just thought about teaching as an opportunity to be paid for reading books,” Dr. Aaron said in that 2001 Globe interview. A past director of the Salzburg Seminar, the prestigious annual gathering of American and European scholars in Austria, Dr. Aaron held visiting professorships at Bennington and Amherst colleges, MIT, Brandeis, and the universities of Helsinki, Warsaw, and Sussex. He was also a member of both the American Academy of Arts and Letters and American Academy of Arts and Sciences. Books by Dr. Aaron include “Men of Good Hope: A Story of American Progressives” (1951); “The Unwritten War: American Writers and the Civil War” (1973), a finalist for the National Book Award; “American Notes: Selected Essays” (1994); and “Commonplace Book, 1934-2012” (2015). A contributor to The New Republic, The New York Review of Books, and London Review of Books, Dr. Aaron was also editor of several volumes, among them “Emerson: A Modern Anthology” (1958), with Alfred Kazin; “The Strenuous Decade: A Social and Intellectual Record of the 1930s” (1970), with Robert Bendiner; and “The Inman Diary: A Public and Private Confession” (1985). The sun snuff itself out? I shall sparkle in the footnote of an article. 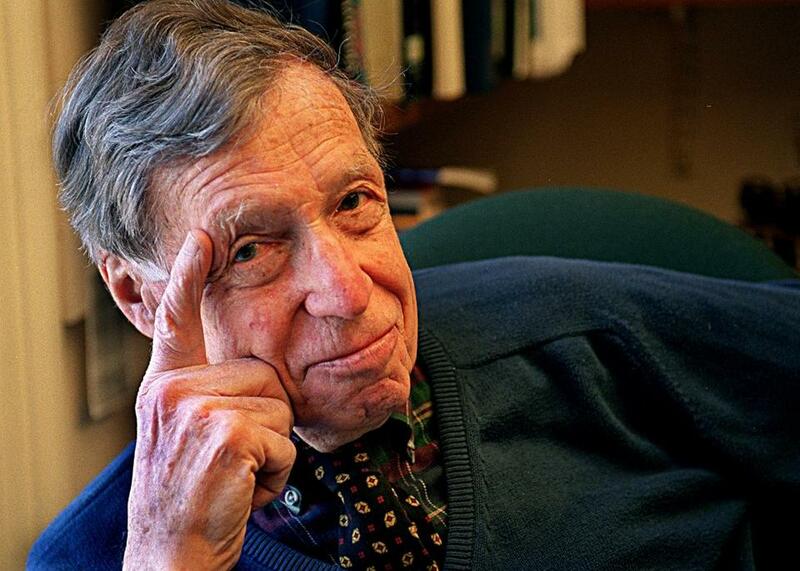 Dr. Aaron, who received the National Humanities Medal in 2011, leaves three sons, Jonathan of Cambridge; James of Shutesbury; and Paul of Belgrade; along with grandchildren and great-grandchildren. Mark Feeney can be reached at mark.feeney@globe.com.